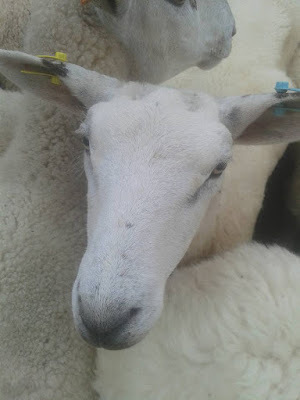 I'm trying to manage what little grass we seem to have at the moment so we'll have some fresh grass to flush the ewes on when it comes time for tupping (that's not yet - I want to lamb late). 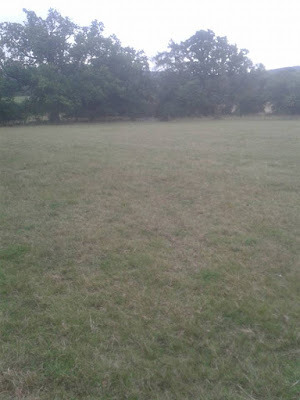 At the moment only the big field (about 6 acres) has any amount of fresh grass on. So rather than give them the whole lot I split it in half (where an old hedge used to be) using electric fencing. It's been a few years since I put any electric fencing up but I certainly hadn't forgotten how to do it. 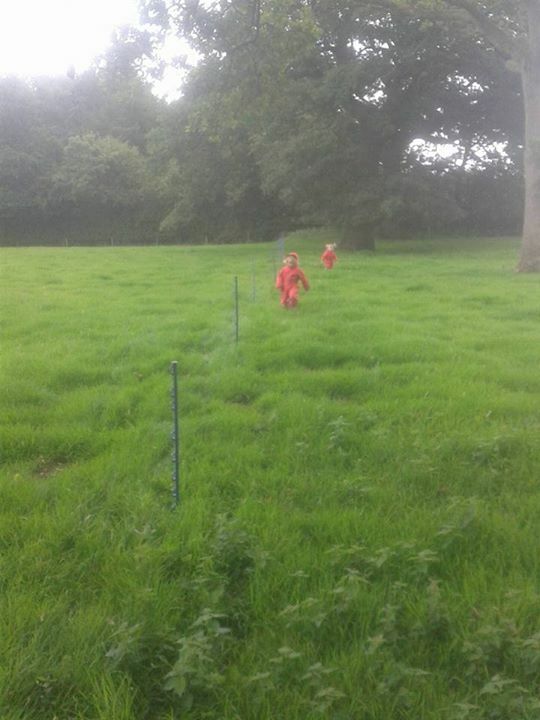 When I was at school in the autumn dad used to pick up my brother and I, we'd get changed in the school car park and then go move fencing in different fields that we rented. The girls enjoyed helping but I did make them walk along way - up and down with me each time they were pretty tired by the end. 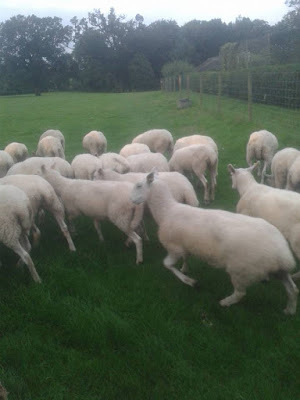 Then yesterday morning I got up early and got the sheep in, drenched them for worms and put them out on the fresh grass (all before the wife left for work at 7). A few are looking a little thin and have lost a bit of condition so I want to fatten them a little bit. I also need to be keeping a look out for a good tup for sale to run with my ladies soon. Hopefully the two little fields I've just taken them off will recover enough now to have some fresh grass in a month or so. It's another juggling act and one where it will take a bit of learning. Each patch has different grass and conditions and it all grows back at different rates and is weather dependant so it'll take me a few years to learn how long each patch will last when the sheep move in and how long it takes to come back. Who else has to constantly juggle their stock into different fields to manage their grassland? Although it is more labour intensive it is a much better way to manage the land I have here and I'll get much more from the land in the long run because of it. Yeah, grass is growing but still not enough. I'll make less hay next year and that should help. Also I need to get rid of some of the lambs! I always wonder when farmer's choose to change their livestock to different grazing. Some farmers leave them there until the fields are white and hardly any grass. I always have too much grass. Do you use any granulated fertilizer Kev? We haven't used any this year. I've been leaving it a bit late and there's very little left when I move them on but that's because I've had to hang gates or put up fencing. I'm better set up now, but leaving them for a little longer does mean they eat the rubbish as well! No fertilizer here unless it comes out of the rear end of a sheep! I rotate our sheep as much as possible. The only field I could put them in that doesn't require rotation is the 12 acre hay field and I try to keep them out of there until after I cut and bale it although some times I have to run em in there for a bit to let other fields grow back up. I complain about Johnson Grass alot but I will admit it grows fast, the sheep love it when it is short and it takes a long time for them to kill it off even with constant over grazing. When we get rain like we did this year it pretty much keeps up with their constant munching. 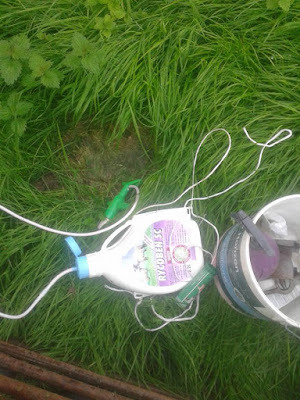 Then of course we start getting the Barberpole worm problem from all the wet can't drench for them anymore because of the resistance factor and once you graze a new field it is compromised. Yeah, now I've hung the gates I should be able to rotate much more and keep them moving. I also made too much hay this year but that's because I got he sheep late and had too much grass by the time they came. I'm either going to have to feed the lambs some corn or move them to my dads if I don;t sell some soon. 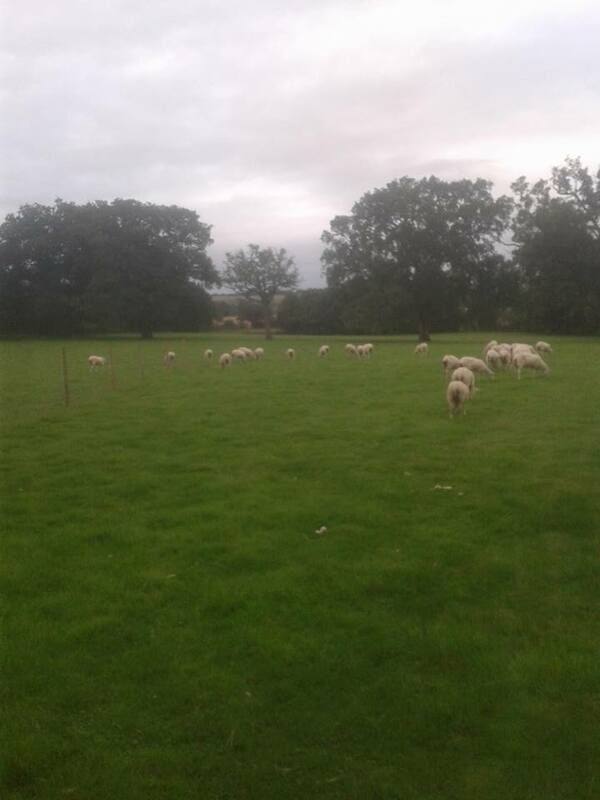 We divided our 4 acres into 5 paddocks when we had sheep ( only 4 ewes,ram,wether ) and moved them every week. We were told that sheep shouldn't hear the church bells twice on the same grass! We followed the sheep with a movable chicken shed and forty hens. Seemed to work OK, less problems with worms hopefully, though we still wormed them anyway. All seems a long time ago now *Big Sigh* about 8 years I think. The church bells ring quite often here - Monday night is practice night! 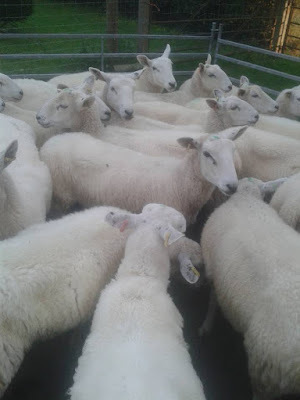 I still having got enough sheep to make money but enough to cause me worry! Hopefully we'll have some great meat from them though. I just wish people realised how much effort went into them. We divide our land into two areas, and juggle the girls depending on grass growth - good for worm control too. This summer has been particularly difficult as it has been so hot and dry, but now it has greened up so we've stopped supplementary feeding the pellets. No pellets fed here yet but I'm slowley running out of grass. We'll see how it grows over the next month as to what I'll have to do. I have a plan B but it involves moving them and I'd rather not if I could!